UCLA astronomers report the discovery of a remarkable star that orbits the enormous black hole at the center of our Milky Way galaxy in a blistering 11-and-a-half years—the shortest known orbit of any star near this black hole. "The exciting thing about seeing stars go through their complete orbit is not only that you can prove that a black hole exists but you have the first opportunity to test fundamental physics using the motions of these stars," Ghez said. "Showing that it goes around in an ellipse provides the mass of the supermassive black hole, but if we can improve the precision of the measurements, we can see deviations from a perfect ellipse—which is the signature of general relativity." More information: "The Shortest-Known–Period Star Orbiting Our Galaxy's Supermassive Black Hole," by L. Meyer et al., Science, 2012. ... therefore not only slows down the flow of time but also stretches or shrinks distances. RealityCheck - you need a reality check dude. Are you seriously trying to somehow dispute Einsteins theory of gravitation? It may be true than an editorial like this one uses the same sort of geometric metaphors that Einstein used in explaining his theories, but that neither negates or changes ANYTHING that was said. It certainly doesn't suggest some sort of "Establishment Myth". Who are you to say what is and isn't shrunk to the other observer? What makes your reference frame a spacial case? Who are you to say what is and isn't shrunk to the other observer?...What makes your reference frame a spacial case? VD and RC two things you don't want in sensitive areas....like the physorg comments. Ruins the whole equilibrium. To top it all off it's just one guy agreeing with himself. RealityCheck, what about the Lorentz mass increase that is routinely observed (in particle accelerators, particularly)? If that is as real as it seems to be, then why discard the other result of the Lorentz equations: length decrease? If a massive star gains mass as it gains speed in approaching a black hole, what do you suppose the result would be? I dispute general and special relativity. There are no black holes, no expanding universe, no big bang, no time dilation, and no warping of space time. Read my theories at http://www.scribd...heories. ...what about the Lorentz mass increase that is routinely observed (in particle accelerators, particularly)? If that's as real as it seems to be, then why discard the other result of the Lorentz equations: length decrease? You still need to explain why, then, there is mass/energy increase AND time slowing (as demonstrated by cosmic-ray mesons lasting long enough to reach detectors on the ground), but NOT length decrease. As I said, all three of these come out of the Lorentz equations. Support your claims with actual mathematics (or links thereto). In a highly competitive field, this comment might actually win the award for the most anti-intellectual, pseudo-scientific, unlettered and rambling stream of barely sentient consciousness I have ever come across in my 38 years on this planet. My 8 year old nephew would be able to articulate a more coherent critique of this article by banging a keyboard with no vowels with a stick. In the dark. On a skateboard. I can not respond since your comments are too incoherent. Well, if a particle is moving fast enough, then if Relativity both increase that particle's mass and decreases it's length, then when it is moving fast enough it would become a disk-shaped black hole in one reference frame, while appearing unchanged in another reference frame. For example, if a particle is moving 0.999c it will have 22.366 times the mass, and 0.0447 of the length, therefore 0.0447 of the volume, therefore the density of such an particle becomes roughly 500 times the original density in one reference frame, while being unchanged in a co-moving reference frame. As you can see, tack on a few extra "9's" for accelerator speeds, and the particle should become a microscopic black hole. In order to make a black hole with schwartzchild radius equal to one nanometer requires a mere 8.3408e-17 kg. Now that's ten orders of magnitude. Every 2 "9's" in the decimal as a fraction of the speed of light causes Lorentz formula to increase the mass by an additional order of magnitude, AND reduce the length by roughly 1.5 orders of magnitude. So the density of the proton would go up by a factor of roughly 500 for every two "9's" in the decimal place. Length: 0.00447 * original length. i.e. One nanometer becomes 4.47 picometers, one picometer becomes 4.47 femtometers, and one femtometer becomes 4.47 attometers. Since it's an exact metric, you can predict the next pair of "9's" by factors of 10 and 100 respectively. Density: 5,000,000 * original density. When I plug this value into the Lorentz equation, I getthe following mass and length scaling factors for the "other," co-moving reference frame. "proper Radius" of proton: 0.8768 fm or 8.768e-16 m.
This is still 17 orders of magnitude too large, HOWEVER, because the length goes down by a factor of 10 for every two 9's and the mass increases likewise, the schwarzchild radius increases with V.
The scharzchild radius for a relativistic proton increases by a factor of 100 for ever two 9's in the decimal place of the velocity as a fraction of c, therefore a proton moving with 9 additions "9's" in it's velocity would become a black hole. I used comas to help count, even though I'm not sure if that's proper. That's 32 i's and a 51. This looks like a lot, but if they detected a proton with 9 fewer 9's for it's velocity, then I see no reason why "somewhere" and "somehow" in the universe there wouldn't be a proton with this much velocity. It would seem like there would have to be such particles somewhere. 1, So then how would we detect them? 2, are they large enough to consume other sub-atomic particles, or are they too small to interact? It turns out this is, within margin of error of the numbers cited by wiki, the exact speed at which a proton should become a black hole, and it's also the exact speed at which the proton's length becomes exactly twice the Planck length, or it's radius in the direction of motion is compressed to Planck length. Surely this would be a microscopic black hole, but I don't think our accelerators have gotten that fast. You can't do the math for this in a calculator, because the calculator doesn't have large enough variables to save the values to enough significant digits to do it with enough precision to be useful. This is what happens when scientific 'establisment' becomes an incestuous circle of 'believers' in their own nonsense fairy stories about the actual observations. No, this is what happens when popular press authors dumb science down to the point where it has more in common with discredited nineteenth century concepts than current theories. "Caveat Emptor!" indeed. You have the problem the wrong way round, Einstein's actual theory is purely geometrical. The idea of "time slowing down" or "distance shrinking" is the metaphor. Most of the posts in this thread are based on misconceptions. Relativity says that mass is invariant, it does not change with speed. It also says that, in their own rest frame, moving objects do not shrink and clocks tick normally. All the effects observed are geometric in origin and result from projection of values in one coordinate frame onto a different set of axes. Lorentz Aether theory says objects shrink when moving relative to the aether, moving clocks tick slower and mass increases. Both theories result in the same maths in flat space (the Lorentz Transforms) hence cannot be distinguised experimentally or by thought experiments, you are wasting your time trying. The reason why relativity is overwhelming accepted is that it was extended to GR which models gravity. In GR, the geometrical basis of special relativity is modified to include 4D curvature driven by the stress-energy tensor (for example in the form of mass). There has never been an aether-based equivalent and the limit of GR as the mass tends to zero is the geometry of the Minkowski Metric, i.e. special relativity. GR is of course extraordinarily well supported by experiment and observation. Who's relativity are you using? Einstein's relativity most definitely says that mass is variant from one reference frame to another, and it varies by a scale of 1/(sqrt(1-(v^2/c^2))). Therefore if a proton is moving at the velocity I gave above, with the 32 "9's," as measured in some reference frame "A," then in the co-moving reference frame, that is the frame where the proton appears stationary, the proton will be a black hole, at least based on the VARIABLE mass and length predicted by Einstein's and Lorentz equations combined with the escape velocity equation (to find the schwartzchild radius. The variance of mass is one of the primary reasons accelerating a star ship to relativistic speeds is widely considered to be impossible or nearly so, and in the realm of science fiction/fantasy. This is why scientists attempt to solve alternative field problems like gravity manipulation or EM manipulation to warp space itself instead of "propulsion". Truth be told, we couldn't accelerate a ship anywhere near the speed of light, even if only Newton's mechanics were true, nevermind Einstein's relativity, because the variance of mass really doesn't become logistically significant until 0.3c anyway. If you can accelerate to 0.3c in Newton's mechanics, then the extra ~5% mass predicted by Relativity equations is not that big of a deal after all, and only requires a relatively small increase in fuel to fix. When you get to like 0.6c, you're an extra 80% of mass. As I recall, the fuel requirement of an ideal rocket goes up by power of 1.5, so needs ~2.42 times fuel of Newton's mechanics. All of that being said, we can't even get to 0.1c, and relativity has almost no effect at or below 0.1c, an increase of only 0.5% of mass. This means that contrary to popular understanding, further increases of our rocket ships velocity is not significantly impacted by the Theory of Relativity AT ALL until at least about 0.3c to 0.4c, which we are nowhere near achieving. The limits of Newtonian mechanics alone is far more than we have ever come close to overcoming. This is 14,278 times less than the speed of light, or ~1,428 times less than 0.1c. 0.1c is the slowest that you could theoretically travel in a colony ship to make it between two nearby stars in one "generation," as used for the unit corresponding to about 40 years. Since mass is only affected by one half of one percent at this velocity, then Relativity is not the main prohibition to interstellar travel, because we can't even move fast enough for it to be a factor. After watching Through the Wormhole I read these articles with Morgan Freeman's voice. Relativity says that mass is invariant, it does not change with speed. How is it possible, after then, the electrons in outer shells of heavy atoms are moving with relativistic speed and their orbitals are relatively smaller, after then? For example they yellow http://www.fourmi...n_glow/, low melting point of mercury and/or high oxidation potential of lead dioxide is explained just with larger mass of outer electrons, which is routinely attributed to relativity. As I said, the two approaches result in identical equations so in every situation, they both make identical predictions. SR can never be distinguished from LET directly (but GR reduces to SR, not LET). The idea of "time slowing down" or "distance shrinking" is the metaphor. What else remains measurable from general relativity theory, after then? Most of experimental evidence of general relativity is based just on these "metaphoras". All the effects exist and are measurable but they are geometric in GR. Time doesn't "slow down", it simply maps to different coordinate durations due to geometric projection. No, it is a single set of self-consistent equations but different authors explain it in different ways. Words are a poor substitute for maths. Of course, just project between the coordinate axes. I am discussing standard undergraduate relativity as it is taught as a precursor to GR. See Taylor & Wheeler "Spacetime Physics" for example. Exactly, it would be paradoxical for it to be a proton in one frame but a black hole in another. The real science is unambiguous, a proton is a proton regardless of the frame of the observer. The variance of mass is one of the primary reasons accelerating a star ship to relativistic speeds is widely considered to be impossible .. The energy required rises non-linearly to infinity when v=c. You can treat that using the Newtonian equation for kinetic energy and infer that mass increases but the geometric understanding of relativity merely uses a more complex equation with invariant mass. There's nothing wrong with using relativistic mass as long as you are careful to account for all effects but you need to understand the invariant approach too if you want to go on to understand GR. Einstein identified the existence of gravity with the inertial motion of accelerating bodies (i.e. bodies in free-fall) whereas contemporary physicists identify the existence of gravity with space-time curvature (i.e. tidal forces). The interpretation of gravity as a curvature in space-time is an interpretation Einstein did not agree with. ..the proton will be a black hole, at least based on the VARIABLE mass..
Don't be silly, you know perfectly well there is no such thing as "AWT". The interpretation of gravity as a curvature in space-time is an interpretation Einstein did not agree with. Similarly, Newton wrote in the Scholium of the Principia that space was absolute and there was such a thing as absolute motion relative to that space, but in the mechanics he derived from that notion, any hint of absolute motion disappears and is replaced by Galilean Relativity. Einstein's experiments on the photoelectric effect were the basis for QM (Planck's original understanding was that EM radiation was bursts of waves rather than particles) yet Einstein never accepted QM. It is not unusual for scientists to be responsible for breakthroughs with which they are subsequently uncomfortable. However, that is all irrelevant, it is a matter of fact that the equations of GR are purely geometric and Newtonian mechanics is Galilean invariant regardless of the preferences of their authors. Before YOU can have a theory, you must first have some piece,,, some infinitesimal part, some fragment,,,, no matter how small,,,, of the reality we find ourselves in to base your theory on. Your reality is in some universe completely outside of the universe you are finding yourself stranded in. I can see why you are a failed science FICTION writer. Oh yeah, I almost forgot,,,, please never, ever, help your kids with their homework,,, otherwise they will find themselves the objects of ridicule and derision. Read my theories at http://www.scribd...heories. P.S. Good move taking down your "theories". I don't blame you for not wanting to endure the reviews of your "theories". Strip the trailing period off his malformed link and you can witness the firepower of his fully armed and operational battle station of love. Thanks, that is more fun than a person deserves in this life. The "Yarbrough Paradoxes" are a hoot. They sound like the writings of a person with a sever delusional disorder fueled by some sort of illegal substance. If he had spent the time required to write all that drivel actually reading and studying, he would be a post-doc by now. I bookmarked for when we need a good laugh at work. "Later studies indicate that the top cruise velocity that can theoretically be achieved by a thermonuclear Orion starship, assuming no fuel is saved for slowing back down, is about 8% to 10% of the speed of light (0.08-0.1c). An atomic (fission) Orion can achieve perhaps 3%-5% of the speed of light. A nuclear pulse drive starship powered by matter-antimatter pulse units would be theoretically capable of obtaining a velocity between 50% to 80% of the speed of light. In each case saving fuel for slowing down halves the max. speed." -Like I say google is your friend. Your only friend. Muons created in lab have lower velocity than one created by incoming cosmic ray hitting high in atmosphere, so its internal decay-processes (like a clock tick rate) proceed at faster rate than those of much higher energy muon. That is just the LET interpretation of the effects. To explain the MMX, you also need length contraction and to explain the reduced acceleration of high speed electrons in electric fields measured by Thomson you need relativistic mass but taken together these ad hoc phenomena produce identical results to SR.
As I said in a previous post, it is only when you move on to GR that the interpretations can be distinguished. ...To explain the MMX, you also need length contraction and to explain the reduced acceleration of high speed electrons in electric fields measured by Thomson you need relativistic mass but taken together these ad hoc phenomena produce identical results to SR.
Or "relativistic mass" as it is usually known. You also need length contraction and since these are observer independent effects, the cause needs to be velocity relative to some reference, the substance commonly called the "luminiferous aether". As I said, you are simply restating Lorentz's aether theory. 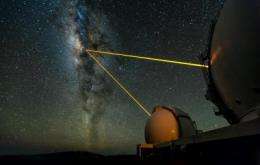 Graphic at top of article looks wrong to me, shouldnt the laser adaptive optics "star" beams be parallel? This is demonstrated by the clocks on fast planes experiments. The difference between clocks in relative motion is observed, internal changes is one interpretation but it also matches SR's geometric explanation. So why "you also need contraction"? Because the amount of clock slowing observed on planes is the square root of the total effect in the MMX. You need length contraction by an equal amount to explain the null result of the MMX. Put those together and you get LET. I'm not sure why you say "no", I wasn't disagreeing with the fact that it is observed, just noting that it doesn't distinguish between the interpretations. MMX results also support MY TOE perspective that space/aether does NOT COUPLE physically to photons, .. I think you need to look up the experiment, to explain the null result, aether theory needs to assume that the material of the arms of the interferometer is length-contracted, not the photons. Materials such as invar alloy or fused quartz have been used for example. The dilatation of time can be modeled easily with spreading of transverse ripples at the water surface. This doesn't imply the existence of reference frame, just because the transverse waves are background independent in all material media, including the vacuum. The surface ripples don't care about motion of water, until they're actually transverse. Hi Fleetfoot. The "no" was to your "relative" and "indistinguishable" interpretation. Pointing out that the differing clock 'absolute counts' were just that, "absolute cumulative count values" and not "relative" to anything. Ah, ok, thanks for clearing that up. When we say a clock on a plane is slowed due to speed, that means it produces fewer ticks over some arbitrary duration than a clock which is not moving, i.e. it is relative to a "stationary" clock. Such assumed/interpreted "contraction/dilation" of particles, distances (interferometer "arms" etc) or time is not necessary .. It may not be a necessary part of your ideas, but it is necessary experimentally. If length contraction doesn't come out of your maths as well as clock slowing, it will fail to predict the null result for the MMX. The dilatation of time can be modelled easily with spreading of transverse ripples at the water surface. This doesn't imply the existence of reference frame, just because the transverse waves are background independent in all material media, including the vacuum. The surface ripples don't care about motion of water, until they're actually transverse. Rubbish, the wave motion is the vector sum of the motion of each point on the wave relative to the source plus the flow of the water. Try adding a flow of the medium to your animation and see what happens. Hi Fleetfoot. :) Again, "no". The clock counts reflect absolute changes in the state of the SAME clock under different 'speed' runs. No need for another clock, just take same clock at one non-relativistic) speed over a course; then at another significantly different (non-relativistic) speed and just compare accumulated absolute counts from 'reset-zero' of each run. See? Absolute counts in same clock at different runs of different speeds. No other clock to be 'relative' to. Nothing else need be involved except one clock at different-speed runs over same-energy-space. Hi Fleetfoot. :) Again, "no". The clock counts reflect absolute changes in the state of the SAME clock under different 'speed' runs. No need for another clock, just take same clock at one non-relativistic) speed over a course; then at another significantly different (non-relativistic) speed and just compare accumulated absolute counts from 'reset-zero' of each run. See? Absolute counts in same clock at different runs of different speeds. No other clock to be 'relative' to. And the MMX interpretation as "also requiring contraction" is an unnecessary 'artifact' of the abstract/theory ..
No, it is nothing more complex than Pythagoras theorem. Try working it out yourself, there are plenty of explanations all over the web. No. The artificial star is created by disturbing the air with the energy of intersecting laser beams. Each beam causes disturbance all along its length, but the disturbance at the intersection point (which is set at the desired altitude) makes the reference "star". Try adding a flow of the medium to your animation and see what happens. The spreading of transverse waves doesn't depend on the "flow of the medium". Until these waves are transverse, then the motion of their environment has no meaning by the whole definition of the "transverse" word. Actually the tiny capillary waves at the water surface aren't affected with motion of underwater very much, as they're driven with surface tension of water nearly completely. Therefore my model remains physical even from the water surface perspective. Then you have no way of determining the duration over which the counts occur. You need two. Oh, I see what you're getting at. :) All that the plane needs is the usual speed indicator system (Pitot Tube or whatever) already calibrated for speed readout during two runs over same route distance. Two different 'Pitot Tube indicator' speeds over same route will do. The 'standard run' is set with the first run, and the second run will tell what's what when compared. The test clock's 'absolute counts' just have to be sufficiently different for each run to show the speed-related 'tick process slowing' for the faster speed run. Oh, I see what you're getting at. :) All that the plane needs is the usual speed indicator system (Pitot Tube or whatever) already calibrated for speed .. Unless you compare two clocks, you don't have an unambiguous result. Re MMX: Pythagorean theorem doesn't involve "distance contraction", .. Correct, it it just tells you the length of the hypotenuse given the other two sides, but the point is that that is all the "complex maths" you need to show that there would be a fringe shift in the MMX if clocks slow but the arms don't contract. As I said, look up the analysis and try it for yourself, you'll find you cannot get a null prediction without length contraction. Nope, the motion is simply the vector sum of the two motion components (wave and medium) for gravity waves and capillary. Liquids don't support transverse modes (i.e. HORIZONTAL displacement of the surface perpendicular to the direction of propagation). Re MMX: But there is no 'clock' and hence no 'contraction' element in MMX setup or analysis assumptions. Hence no need to include any 'time' or 'contraction' in analysis of results. Just behaviour of the photons. But not necessarily the same distance, that's why I emphasised "unambiguous". The cycles of the light act as a clock. As I said, try doing the calculation, you will find you cannot make it work without length contraction. This was known in the 19th century, it is a really trivial piece of maths and written up in many web sites. The route distance is between markers for different runs over same route. No need to invoke subtle assumptions about such gross start-end points for same clock count start-end over same route for slow/fast runs. Re MMX: No need for 'cycles' to be clocks. The leading and trailing edge of beams/waveforms is what it is. Direct overlay between split beam components will tell absolute beam/waveform differences (if any) by that overlay (interference indicates difference, no interference indicates no difference in waveform (leading-edge to trailing edge for each 'leg' beams). No need to introduce 'timing' of events or any 'contraction' to explain something that is not inherently required for the 'events' to take place and compared absolutely between split beam fronts/rears at overlay stage for extracting 'interference (or not) information in absolute pattern terms. No maths/clock/other abstract assumptions/analysis required. No, each beam creates its own reference by exciting sodium atoms in the ionosphere, they are in fact essentially parallel. Thanks for the correction, Fleetfoot. I *thought* I was correctly remembering a description of the artificial-star technique, but I should have investigated further. Not the point, you need to prove it doesn't change, you can't just assume success. Re MMX: No need for 'cycles' to be clocks. ... No maths/clock/other abstract assumptions/analysis required. Sorry, the onus is on you to prove your theory. The hint is - if you try, you'll find you can't do it. [Not the point, you need to prove it doesn't change, you can't just assume success. Sorry, the onus is on you to prove your theory. .. I think you have that back-to-front, mate. The observed distance markers are the same for each run (unless the earth's diameter shrunk between runs ;-) And since it is others' theories that assume/posit change (contraction), then the onus is on those with those theories who must 'prove' it does change. Fair point but they did that a century ago, both LET and SR are self-consistent theories and match the relevant observations. Now it's your turn. What you claim is that motion relative to causes clocks to slow down by a certain amount. The MMX observationally produces a null result when moving relative to the same which means the speed of light is invariant. The onus is on you to explain that null result, and since you use the same clock slowing factor as used by LET, I think you will find you have to have the same formula for length contraction to achieve that. Hi Fleetfoot. Reality also self-consistent. :) For clocks to change motion from existing state with respect to energy-space, we add energy in one direction or another which either slows or speeds up that prior motion with respect to energy-space. Hence slowing/accelerating tick rates observed in reality. However, light in energy-space we cannot speed up or slow down, it travels at light speed limit at emission. MMX photons remain as emitted until reception irrespective of the 'leg' they traveled. Hence null result. Once emitted, only by changing receiving conditions (dopplering motion of receiver OR receiver at different gravitational potential (altitude) from emitter in gravity well) will photon be received as 'different'. No change in MMX emitter/receiver motion/position, hence null result. For clocks to change motion from existing state with respect to energy-space, we add energy in one direction or another which either slows or speeds up that prior motion with respect to energy-space. Hence slowing/accelerating tick rates observed in reality. There is no "hence" in what you say, just an ad hoc assumption but no matter, LET was always empirical. However, light .. travels at light speed limit at emission. .. Hence [the MMX] null result. Ah, the penny drops, your "hence" is justified this time but that's a different model originally proposed by Ritz in 1908. It was clearly disproved by Sagnac in 1913 (although other observations such as binary star systems made it untenable before it was published). I hadn't realised you were cherry-picking phenomena from different conflicting models, clock slowing doesn't happen in Ritz's "ballistic" theory but Sagnac rules it out with or without that effect. Hi Fleetfoot. No cherry-picking at all. Mere observation without theoretical overlays. In light ring experiments, rotation makes doppler effects one way (wavelength increase) and opposite way (wavelength decrease) the other, as the reflections are made while the mirrors/glass surfaces/emag fields are moving around as they rotate with respect to inertial energy-space frame. All these other theoretical overlays are quite silly. They 'require' so called 'space contraction' and 'time dilation' instead of just looking at the reality of MOTIONS/ENERGY involved and direct effects of same (be it on clock tick rates, mirror-photon dopplering etc etc). It's not me that is 'cherry-picking' things from theory to overlay on the reality observations as they are. Why try to 'fit' these real observed facts into standard and non-standard pet theories requiring contortions of that reality in order to 'fit'. No need for it. Reality is enough to be going on with. Cheers! In light ring experiments, rotation makes doppler effects ..
That's a common mistake, there are doppler effects if viewed from the lab but in the Sagnac experiment, the interferometer is also on the table and rotating at the same rate as the source so there is no Doppler between them. If there were, the fringes would move at a common rate but they are actually static. The interferometer actually measures the phase difference, not frequency and if Ritz's theory were correct, there would be no shift (if neither distance nor speed relative to the source are changed, neither is the time delay hence the phase on arrival). In reality, there is a fringe shift proportional to the angular velocity which cannot be explained by Doppler. Again, this is common knowledge if you do a little research, it's been known since 1913. The effect is used in optical gyroscopes in aircraft and inertial navigation systems and could not exist if the ballistic model were correct. I already agree with you. The Doppler shifts cancel out, .. Excellent, no disagreement there then. The phase shift is what tells that the emag field with the mirrors is moving and the absorption/reemission is ADVANCED ALONG WITH the ring rotation one way while it is RETARDED AGAINST the ring rotation the other way. That's a bit ambiguously stated but I think you have it the wrong way round, in reality, the beam going the same way as the rotation is retarded because it has farther to travel (in the lab frame). They both travel the same distance in the rotating frame hence ballistic theory predicts no phase difference. The only way to CANCEL THAT effect (like cancelled Dopplering in the one ring) is to have a DOUBLE RING "figure eight" .. I will be carrying out that experiment ..
That would cancel it out in all the models so doesn't give any new information, what you need to do is explain (show by calculation) why there is a fringe shift in Sagnac's setup. Hi Fleetfoot. I haven't fully described the proposed setup(s) using double/multiple rings. They allow things which the single ring setups cannot. Explaining the existing results remains your first challenge, if you can't do that, you don't have a base from which to extend the experiment. I'm getting very busy organising some events next month too, it's been fun. Good luck.